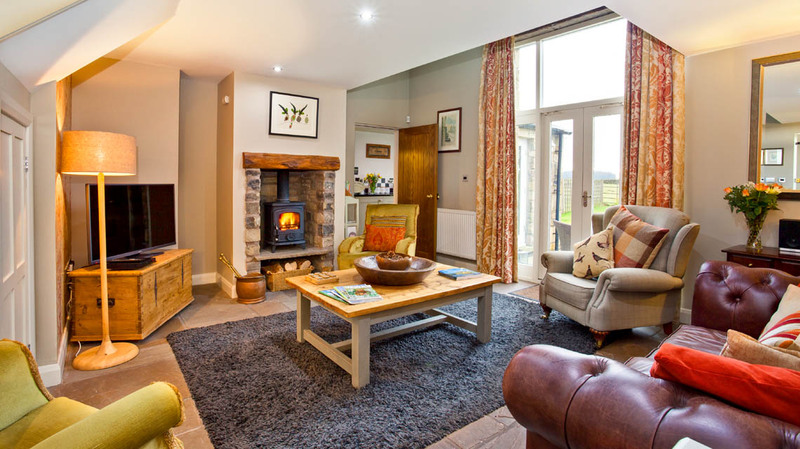 Gamekeepers Cottage is luxurious holiday cottage in North Yorkshire with the Yorkshire Dales on your doorstep. Our luxurious Gamekeepers Holiday Cottage North Yorkshire is a two storey property, very tastefully decorated to a high standard, with a bespoke fitted kitchen and stunning views of the North Yorkshire landscape. Gamekeepers Cottage (Holiday Cottage North Yorkshire) has a real sense of space with a large double height window in the lounge and french doors opening onto a sunny private patio. Views of Pendle Hill in the distance and a tranquil setting, with only the sheep for company, make this the perfect place to relax and unwind. The property has a cosy wood burning stove always well stocked with wood from the forest. The village inn is only 1 mile away and Settle with its market town and famous steam railway is 5 miles away. The A65 is a short drive and will take you into Cumbria and the lake district. Kirkby Lonsdale is less than 30 mins drive, Skipton 20 mins, Leeds about 1 hour away and Clitheroe is 20 mins away. The M6 jct 31 is 40 mins with Manchester 1 hrs drive. On the ground floor, the stylish lounge area with comfy sofas and reclining chairs has a woodburning stove, a large flat screen tv with freeview, dvd player, ipod dock and cd player. Quirky lamps, rustic bowls and squishy cushions add to the homely feel of Gamekeepers. The French doors lead out on to the patio area, where there is a BBQ and a good sized garden table and chairs. Rugs and cushions are provided for those colder starry nights! The handmade designer kitchen is fully fitted with a full size oven, fridge, separate freezer, microwave, dishwasher, granite work surfaces and a Belfast sink. It has its own dining area with table and chairs to sit 6 comfortably. The cupboards are well stocked with all you need to entertain your guests, from plenty of pots and pans and baking equipment to Champagne glasses. There are 2 bedrooms on the ground floor, both with en-suite bathrooms. One has an antique double bed, the second bedroom has two full sized single beds. Stairs from the lounge area lead to the first floor of the cottage and our luxurious master suite. This comprises of a spacious bedroom with a Kingsize bed and a small seating area for reading. There is a landing overlooking the lounge, garden and far stretching views of the countryside, where the desk provides an area to work ( if you really have to ). The full size bathroom has a bath and a walk in shower. The laundry cupboard with washing machine, dryer, iron and ironing board is located on this level. You will find both Gamekeepers Cottage and Cross Cottage (Self Catering Holiday Cottage North Yorkshire) very well equipped. CD’s, DVD’s and a good selection of books as well as board games and a Wii game console (by arrangement). A hairdryer and dressing gowns are also provided. We also include a Wi–Fi connection in and around the Holiday Cottage area. There is an abundance of local interest leaflets with things for all to do. We also have local maps and walking or cycling books you may wish to borrow. If you are not up to a long walk, there are lots of small walks around the area. For the sightseeing motorist there are many places of interest to visit. We have brochures and leaflets on local attractions and walks, available for your use. Cyclists are welcome. The riding in the area is second to none. Nearby Gisburn Forest has miles of Mountain Bike trails for all skill levels. There are safe routes on quiet country lanes for the novice, to very rewarding days out for the serious road cyclist. The list of routes from the door is endless. We believe we have thought of everything to help get your holiday off to the best start, however, should you be missing anything, if it is within our reach, we will provide it! 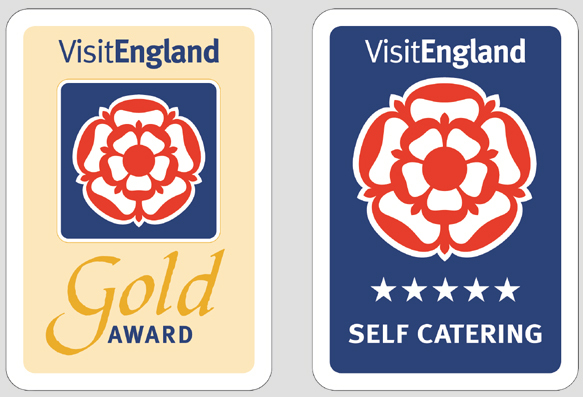 If you would like a recommendation for eating out whilst at the holiday cottage north yorkshire, we will gladly pass on our extensive knowledge of eateries in the surrounding 30 miles of our beautiful location! I think we may have eaten at most places, from fine dining to the best fish and chip shops. Alternatively, you can discover them for yourself.